Between my love for the grape and of our recent trip to the Finger Lakes (and yes, I know I owe you guys more than a few posts about it), a lot of riesling has found its way into my glass in recent weeks. A lot of riesling. So what did I do when we got back from our trip and pulled wines to taste and review as a part of my weekly lineup? I included yet another riesling: Jamesport Vineyards 2008 Riesling ($30). Long Island riesling tends to be quite different from those made in the Finger Lakes. Long Island renditions tend to be riper, broader and usually have less of that crackling acidity that marks the best Finger Lakes wines. I'm not sure when this wine was bottled, but I have a feeling it may have been fairly recently. When first opened, there's quite a bit of sulphur funk here, but it blows off pretty quickly revealing aromas of green apple, honey, lapsang souchong (a kind of smoked tea) and grapefruit. The palate is medium-bodied and 2.5% residual sugar is balance very well by fresh-but-not-bracing acidity. It's very appley with more of that smoky tea character, honey-poached peaches and hints of grapefruit. The finish is medium-length and very honeyed, which says to me that some of the crop was afflicted with botrytis. A very different wine than those I tasted in the Finger Lakes, but very interesting. Unfortunately, at $30, I don't think it's much of a value. A shared passion and commitment to the "buy local, sell local" mindset brought Shaw Vineyard to select Elmira Distributing as its new distribution partner. Shaw Vineyard has a reputation for high-quality wines across their entire line and owner Steve Shaw is happy to be in the company of other wineries in Elmira Distributing's portfolio. 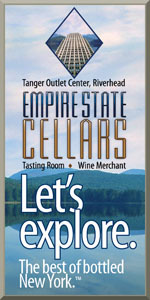 Elmira Distributing represents a handful of Finger Lakes wineries, including Atwater Vineyards, Castel Grisch, Sheldrake Point Vineyards and now Shaw Vineyard. Both Shaw and his son, Steve Shaw Jr., respect the roots and good record that Elmira Distributing has in the Finger Lakes for promoting and selling local wines. Shaw is hoping that local restaurants will "give us (Finger Lakes wineries) more of a chance" and "help to support those who support you." When the demonstration room at the New York Wine & Culinary Center filled up at 10 a.m. on Tuesday morning, 328 glasses of cabernet franc lit up the amphitheater like strands of single-color Christmas lights. It was a bit daunting for the 42 winemakers, winegrowers, industry professionals, newspaper writers, retailers and bloggers. And that was just the first flight. When the event (get some back story) finally ended three hours later we had tasted through 13 Finger Lakes 2007 cabernet francs, 3 Loire Valley cabernet francs, one Long Island cabernet franc, and 5 Finger Lakes 2007 reserve cabernet francs. Wine writer Holly Howell even brought her own gift for the group, a 2002 Loire that was just beautiful. Finger Lakes cabernet franc has a recognizable style. It was pretty remarkable to see that the participants had no trouble discerning which wines were from the Finger Lakes and which were not. Cabernet franc has a local identity, which is important. It's not always good, though. Some of the wines gave off odd, citrusy flavors (others referred to this as a persistent sour cherry note), and some of the wines still lacked depth and weight -- even from a ripe vintage like 2007. But the best of the group were balanced with bright cherry, black pepper, and grilled herbs, and the very best added layers of mouthfeel that extended the finish of the wine. The top-scoring wine was the Ravines Wine Cellars 2007 Cabernet Franc, and its appeal was best summarized by Fox Run assistant winemaker Tricia Renshaw. She remarked, before seeing the bottle revealed, "This is a delicious wine with great mouthfeel." Can it be coincidental that the top-scoring wines were among the lowest-cropped wines? Yes, under-cropping can be an issue, but as one winemaker pointed out during the event, "The lower the yield, the more weight cabernet franc seems to have. You can't get that mouthfeel with over-cropped vines." One winemaker confessed to me, in confidence, that recently they weren't careful and ended up with 7 tons per acre of cabernet franc. "Not only was the wine not very good, but there was a huge amount of it!" he said. Local winemakers do not seem to enjoy wines from other regions. This statement is a little broad-sweeping and probably a touch unfair, and maybe it will get some backlash, but I can't help it. The bottom two wines based on score were the 2005 Charles Joguet Chinon (Dioterie cuvee, $36) and the 2005 Domaine des Vallettes Bourgueil ($12). The other non-FL wine, the Shinn Estate Vineyards 2007(Long Island), finished in the bottom half of the scoring pack. Ah, but break down the numbers: Retailers and writers rated the Chinon and Shinn in the top 6 wines, while wine industry professionals had them way down the list. Having now tasted the Shinn, I can say that I find all the hype for this wine to be absolutely justified. That's why I couldn't figure out why the majority of local wine professionals didn't care for it, and I wonder if there's a bit of "house palate syndrome" going on. Granted, this is a small sample size to choose from. The Chinon bore some Brett character, and some in the audience said it was over-the-top. I simply hope that local professionals don't equate foreign wines with lesser quality -- simply because they're different. (I also make this assertion based on my exposure to many industry professionals who have rarely tasted wines from other regions. Many of the best local winemakers seek out wines from around the world, but I also see some who don't seem to be curious or interested in wines that are not from the Finger Lakes). Getting retailers and winemakers together is a wonderful idea and should happen more often. How often do we complain about retailers' lack of knowledge about Finger Lakes wines? Well, these events will break down that barrier. Some of the most astute comments came from the retailers who have to sell the wines. By the time we all left, many people were wondering why an organization like the New York Wine and Grape Foundation had never put together an event like this before. How the hell do you sell Finger Lakes cabernet franc? This tasting made it pretty clear that cabernet franc is just about an ideal food wine. That's not a pejorative, either. Some writers damn a wine with the faint praise that "perhaps it's a nice food wine," which is another way of saying, "This plonk can't stand on its own." That's not the case with Finger Lakes cabernet franc, but can you sell a wine by marketing it as a food wine? I think you can. "The key word is balance," said Ravines winemaker Morten Hallgren. "We're not trying to overwhelm people with this wine. It's about balance." It made me envision a poster hanging in a retail shop. There's a high-wire with a bottle of Finger Lakes cabernet franc holding a rod and staying upright. Down below in the net is a pile of "off-balance" bottles. There is a simple slogan: "Don't lose balance with dinner tonight. Choose the right wine." But Gavin Sacks of Cornell pointed out a larger challenge: cabernet franc is not a hedonistic grape compared to consumer favorites like cabernet sauvignon. And, as Gavin says, "A good rule in business is that you don't want to have to educate your customers about a product. You want it to be easy for them." One thing that's easy for customers is oak. That could explain why the Keuka Spring Vineyards 2007 Cabernet Franc was loved by retailers and writers -- but not by wine professionals. It has a sweet leading edge, and in the KSV wine shop the description highlights that oak flavor. "Ultimately we have to make wine that people want to buy," notes winemaker Mark Wiltberger. Sadly, cabernet franc is not ever going to be an easy sell. But it's worth the work to bring it to more tables. I love the grape, and while I don't love everything coming out of the Finger Lakes, there is real evidence that cab franc has a strong future here -- if anyone takes the time to buy it. Note: If you're interested in the top half of the scores from Tuesday, they're listed below. Back in mid-June when Evan visited Hunt Country Vineyards, new winemaker Jonathan Hunt singled out Valvin Muscat as the grape he is most excited about working with. At the time, I thought it an interesting, even surprising choice. The Finger Lakes region shows limitless potential with classic aromatic white varieties like riesling and gewurztraminer. Why would a winemaker with long-time family roots in the region choose a hybrid developed by Bruce Reisch at Cornell University that was only released in 2006? Apparently, he truly believes in the grapes potential. And, after tasting this wine last week, I can see why. I doubt Valvin Muscat will ever come close to rivalling riesling in the region, but there is plenty to like about it. The nose is bright, fresh and extremely floral (think honeysuckle and a spring meadow), with only the most subtle pear note way in the background. Overall, this is a bit one-note, but that one note is classic muscat. Harvest is coming, and if any winemaker or grape grower tells you that things are right where they need to be in the vineyard, they're spinning like crazy. In basic terms, most growers in the Finger Lakes are anywhere from 10 to 14 days behind ripening schedule. It's not just a lack of heat that has been a problem. The heavy and near-constant June rains put growers in a difficult spot, and July simply failed to dry it out and heat things up. In other words: No pressure, August, but it's kind of up to you. "Right now we're headed for a lot of sparkling wine," said Fred Merwarth, winemaker and owner of Hermann J. Wiemer on Seneca Lake. "Getting things ripe is going to be an enormous challenge for reds especially." Cornell professor Gavin Sacks, whose expertise is in high demand in this region, is cautious about making predictions. But he's not trying to spin the weather, either. "Even with a hot, dry August, it's going to be a real challenge because of the disease pressure and other factors that have already come into play," Sacks told me. "I've seen many vineyards working very hard to adjust canopies and do what they can, but I've also seen vineyards where those adjustments are not being made. That will matter." So would he dump stock on the 2009 vintage already? "Absolutely not. We don't have enough information to say that whites in the Finger Lakes are going to be in trouble. In fact, some of the toughest vintages have seen stunningly strong whites. So I'm not concerned right now about whites. I think there is reason to be concerned about reds." After two strong vintages for red wine in the Finger Lakes, it's easy to understand why growers might be disappointed at this stage of 2009. But winemakers who keep yields low -- winemakers like Merwarth and Ravines Wine Cellars' Morten Hallgren -- say there is one reason to welcome such a challenging weather year. "If anything is going to convince people to reduce yields, you would think it would be a year like this," Merwarth says. Hallgren, who consistently encourages growers to bring their vineyards into balance, agrees. "There is an excess of grapes to begin with," Hallgren explains. "Growers have not been able to sell all of their crop, or they're not getting a good price. So instead of letting fruit rot, the solution is to grow less of it. And as a result of that, you'll get better wine." It's true that it's possible for vineyards to be under-cropped, but that's hardly a concern in this region, where some winemakers confess of vineyards producing 8 tons an acre or more. And it's still possible that a heat wave could salvage the vintage on the red side. In the meantime, industry experts are encouraging growers to watch this video of White Springs Winery's Derek Wilber explaining how to meet the challenge, manage the vineyard and get through a tough weather year. "We've been challenged before," Wilber says. "If you've grown grapes in the Finger Lakes for very much time at all, you prepare yourself for anything. And if we're getting the grapes more exposure to the sun through leaf thinning, and if we're guarding against disease, we can have another strong year. Don't give up on it yet." Too often we get caught up in the idea that every wine has to be mind-blowingly complex, nuanced and age worthy. Sometimes it's good to take a step back and drink a wine that is just plain delicious to drink with your dinner -- now, not with any aging the cellar. Bedell Cellars 2008 First Crush Red ($18) is one such wine. You won't find too many 2008 reds released already, but this one doesn't see a splinter of oak in its creation, and it's probably at its best right now. Is this a wine that is going to make you say "Hey, Long Island can make some world-class reds?" No, but this blend of 77% merlot and 23% cabernet franc was absolutely perfect with the grilled, herbs de Provence-crusted pork chops tonight over local sweet corn, zucchini and pickled red onions. On the nose, it's all red cherries and plums, fruity but not overly so. The palate is medium bodied with more cherries, plums and hints of briar and smoke. There is just a little skin tannin here and good, food-friendly acidity to bring structure. At $18 (at the winery) it's overpriced, but I've seen the previous vintage (which wasn't as good) for as little as $11 at shops. For that, it's a good value. Sometimes, it's great to find a wine as satisfying as this one. Somtimes, that's enough. More than enough. Tomorrow is an exciting and important day for cabernet franc and the Finger Lakes. I've helped to organize a cabernet franc tasting at the New York Wine & Culinary Center (NYWCC). 16 wines will be tasted -- some from the Finger Lakes and some from other cabernet franc-producing regions. The wines will be divided into two flights of 40 minutes each. We will then reveal the wines and their scores from the participants. Following the tasting, the NYWCC will serve a sure-to-be excellent lunch, where we'll pour a non-blind flight of reserve cab francs from the Finger Lakes. I imagine some critics might argue that we're cherry-picking an excellent vintage while ignoring other lesser vintages. Not so. While it's true, we're trying to see how cabernet franc fares when the weather is nearly ideal, this is hardly cherry-picking. That's because we're not saying this is what cab franc will be every single year; we're saying that this was an excellent year, so let's see what Finger Lakes potential truly means for the grape. And while '07 was a strong vintage, it's not crazy to think we could see similar heat again (2009, er, notwithstanding). It's also quite possible that the participants will find the '07 vintage to be a letdown. Warm weather is no guarantee for great wines. Growing practices continue to lag in many vineyards and winemaking technique varies from place to place. The NYWCC has been more than generous in providing space, glassware and expertise for this event. While we don't assume it will be a definitive answer regarding that varietal and that vintage, it will certainly be instructive. And, I'm guessing, a hell of a lot of fun. We had a great duo of vacations, and now that we've recovered for them, it's time to get caught up with all the writing the trips have inspired. Stay tuned. Saranac Imperial IPA is produced by the F.X. Matt Brewing Company and Saranac brand stirs up mixed feelings amongst the many self-proclaimed "beer geeks." While all knowledgeable beer fans recognize the contributions that the Matt family have made, there are some who love this line of beer and others who think the line is nothing more than average. This particular beer pours a dark amber color with a finger width, off-white head. The aroma is sort of cloudy, with nothing more than muddled hops and malt showing through. The body has some malt up front with a very faint sweetness before the beer starts to become very dry. A decent amount of hops come in through the middle and the finish is very dry and lingers for quite awhile. Overall, this is a very nice Imperial IPA. While the beer is bone-dry it is not overwhelming at all and the nose is the only aspect of the beer that holds it back from being an all-time great. A very, very good beer. The beer's bone dry, very hoppy body coupled with the high ABV call for a spicy, yet hearty dish. The first thing that popped into my mind is chili, although this can go very well with spicy Thai or Mexican dishes. "What We Drank" is back after a one-week hiatus (caused purely by my hectic travel schedule). As always, we have a diverse grouping of submissions this week. Shockingly, no New York wines made the cut this week! Last weekend, we tasted a lot of wine in the Finger Lakes. And I mean a lot. Enough that by Saturday evening, Nena and our friends C and A were a little worn out I think. But, with Evan and Morgan coming to the house we rented for dinner (and more wine) everyone bucked up and we had an epic evening of good food and drink -- with lots of laughter. I don't know a ton about CdP, but after tasting this Bois de Boursan 1999 Chateauneuf du Pape that Evan brought, I think I'll be spending some money to explore them more. This one had a beautiful briney, caper berry note that was backed by blackberry, cherry and charcoal-grilled herbs. Evan tells me this is an old school CdP. As you can see at right, the house we rented was lacking decanters, so we made due with what was available. The Koolaid pitcher worked just fine. "I'll let you in on the secret of brewing beer," says brewmaster and friend Matt Arlauckas. "If you can boil water, you can brew beer." Well, it's one thing to brew beer, but quite another to brew it very, very well. This was my first taste of Matt's home brew and -- while I'm certainly no beer expert -- it was outstanding. On a hot (okay, really warm) summer day this was the perfect antidote to yardwork. For this batch Matt used pelletized hops, but he's growing his own hops, which will be ready in the all of 2010. Can it really be that easy to start your own brewing operation? He insists it is, and in the end it doesn't sound that dissimilar to winemaking: "Just care about what you do," Matt says, "and the rest falls into place." This weekend brought me and my husband to the Jersey shore for the first time in four years. We hit the newly (to us, at least) revitalized downtown of Asbury Park for dinner and wandered into the promising-looking Market in the Middle, a wine bar/bistro. The service and setting -- including a pretty back garden -- were promising, but the food was generally underwhelming. One thing, however, that did not disappoint were the cocktails. My husband ordered a campari/blood orange martini, and I opted for the Bloody Port Royal: Gosling's rum, ginger beer and blood orange. It was a summery, citrusy variation on the dark and stormy, which is one of my all-time favorites. If a bushel of blood oranges ever comes my way, I will definitely add it to my cocktail rotation. Blueberry wine? Yes, they make it in Maine, but where else would you expect to find it? My wife and I picked this bottle of riesling/blueberry wine by Blacksmiths on a trip to Boothbay Harbor about four years ago, and then we promptly forgot about it. I wish I had re-discovered it about two years ago as it had faded considerably upon opening four years later. Perhaps it was never that good (I suspect it wasn't) but in any case the curious nature of the concoction is certainly worth a mention. of hours together this past week and I brought the Twisted Oak 2008 Viognier to drink at a table in her backyard on a beautiful evening. This is the first Viognier that she had tasted and she joked about trying to pronounce the varietal, "Vogue-ne-ay?" We both took our first sips and in tandem said, "Ooo, this is good." Bright, beautiful tropical fruit lit up our palates and crisp acidity complemented the fruit flavors. After the lingering finish ended, I was hooked. It is now on both of our lists of favorite wines and I'll cherish the memory of the fun evening my sister and I shared, giggling like kids about silly childhood antics. I've been enjoying the Southampton IPA which has been on tap at DEKS for the last couple of weeks (not sure how much is left of the keg though). The Southampton IPA is has a smoother and less candy-like finish than a lot of the West Coast IPAs. It's a good balance between an American take on a classic without forgetting the origins of the style. Long Island Merlot Better Than Bordeaux? I don’t typically pay much attention to the awards, scores and medals bestowed upon Long Island wines by a seemingly un-ending list of publications, festivals and fairs. Most of these competitions are flawed and I just don't think that the results can be seen as authoritative. Over the past 5 years that I've been writing about New York wines, I’ve seen too many great wines “win” bronze medals while obviously inferior wines get gold. I still think, and I hope that I always will, that it’s best to pop a lot of corks and taste for yourself. Trust only one palate — your own. Regardless of my personal opinions about competitions, the results of these tastings can be interesting and help emerging regions (yes, Long Island is still emerging) position themselves in the marketplace. I guess I’m saying that there is some value there, just not as much as the organizers and wineries would have you think. As a part of the website’s “Best of Appellation” program, Clark Smith, Vice President of Best-of-Appellation Evaluations for Appellation America, led a panel of experts through a semi-blind tasting (I say semi-blind tasters knew that the wines were all from Long Island) of more than 50 local merlots — including 39 from LIMA members. 35 of those wines were awarded “Best of Appellation” status (see the full results), winning either gold or double-gold medals, an impressive showing even in the eyes of a competition cynic like me. Despite Appellation America’s America-centric focus (bias?) for a moment, that is still quite a statement. For an ‘outsider’ (someone not in the local wine industry) to make such a statement speaks volumes about the quality and consistency of Long Island merlot. Smith went on to say that Long Island merlots have a “delicacy and elegance” and are “a very refreshing respite from our California amped-up offerings.” To hear a wine expert — and one from California — make such a statement is refreshing. Especially because I happen to agree with him. Then again, does anyone really like California merlot? But here cdomes the admitted cynic in me: As wonderful — and potentially important — as these results are, they need to be kept in perspective. First, only a handful of Long Island wineries even sent wines out to Napa for this tasting. Wines from many of the best producers on the East End — places like Bedell Cellars, The Lenz Winery, Paumanok Vineyards, Roanoke Vineyards and Shinn Estate Vineyards — weren’t included in this tasting. As such, this only represents a sliver of the true merlot story on Long Island. If the Appellation America panel had tasted a wider range of producers, their findings would be more credible and authoritative. Second, this wasn’t a true blind tasting, so commentary about Long Island merlot versus merlot from Bordeaux or California should be taken with a grain of salt — as one man’s (Smith’s) opinion. It would be great to see how this set of 50 wines would fare in a double-blind tasting with wines from California, Bordeaux , Washington State and other top merlot-producing regions of the world. Maybe we should organize such a tasting this fall. Those two statements are fact, at least in one man’s opinion — mine. Our view from the house on Seneca Lake. The blog is going to be quite for the next couple of days, because Nena and I are in the Finger Lakes for a three-day post-Orlando vacation (with Jackson at my in-laws'). We're joined by our friends C&A who enjoy good food and wine as much as we do. We got to the region yesterday in the late morning and were joined by Evan and Morgan Dawson at Ravines Wine Cellars, where owners Lisa and Morten Hallgren spent some time with us. Lisa is an amazing cook, so if you ever have a chance to eat ANYTHING she cooks, I can't recommend it enough. Her food is only matched by Morten's dry, balanced wines that are easily among not only the region's best but the state's best. Wait until you try the 2007 Meritage and 2008 Argetsinger Vineyard Riesling. Next up was a Finger Lakes Tweetup (an offline gathering of like-minded people on Twitter), hosted by Amy Cheatle at Damiani Wine Cellars, where we met and enjoyed some delicious wines with 30 or so (mostly) members of the Finger Lakes wine community. There were so many great wines poured that I hesitate to pick any favorites. I will say that the Lembergers and Blaufrankisches were popular. As was a rose sparkler that I'll be writing about more shortly. And finally, we ended our day with a delicious dinner at Stone Cat Cafe, just up the road from Damiani. Locally focused (both on the dinner and wine menus) good prices and great food combined to create a tremendous experience. I can't recommend Stone Cat enough. It doesn't hurt that most of the Tweetup folks ended up at the bar for the evening. Our meal warrants its own post, so look for that soon. Today we're spending the day tasting on and around Seneca Lake and tommorrow morning we head over to Cayuga Lake for the day. It's hard work, but someone has to do it. Editor's Note: The photograph, taken in the low restaurant lighting, shows the offending disclaimer mentioned in the text below. I had a horrible wine experience at a popular restaurant this week, and yet I don't want to unfairly malign the restaurant involved. My friends know that I'm constantly talking about service in all industries -- in a competitive and hurting economy I find the easiest way to differentiate yourself is through stellar service -- and yet I don't want to be unfair. This was one server on one night, hardly a large enough sample size to declare a service black hole. But in this case, the restaurant is at fault as well. More on that to come. My wife and I joined two friends for dinner at Jojo in Pittsford outside Rochester. 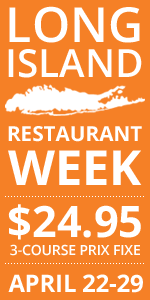 It's an extremely popular and trendy restaurant offering high-end entrees as well as delicious $11 burgers. The wine list is long but mediocre, and that's where we ran into trouble. Looking for a red wine, I waded through the usual suspects (Charles Krug, Robert Mondavi, Chateau St. Jean, etc) and discovered a gem: a 2001 Col D'Orcia Brunello di Montalcino. I was excited because 2001 was considered a wonderful vintage in Tuscany and Col D'Orcia makes more old-school, rustic Brunellos. We happily ordered a bottle. The waitress eventually emerged with the bottle and presented it to the table while getting ready to insert the corkscrew. Thankfully I noticed that she had brought a bottle of the 2002 Col D'Orcia. Being the Brunello lover that I am, I knew that there was an enormous difference between 2001 and 2002. While 2001 was a dream, 2002 was a nightmare, with disastrous weather ruining harvest. Most producers didn't even bottle their Brunello in 2002. (Wine Spectator, for example, scored the 2001 Tuscan vintage 98 points, while 2002 earned 78 points). I didn't want to be difficult and, knowing that many servers don't have a deep reservoir of wine knowledge, I didn't want to embarrass the waitress. I simply said, politely, "I'm sorry, we had ordered the 2001." She stared blankly at me. I continued, "It's no problem, but please don't open that bottle. I'm sure we can find something else if the 2001 is not available." At this point I guess I expected the waitress to offer a half-apology or some assistance in finding an alternate wine. Nope. She went from agape to seemingly furious, glaring at me without speaking. I felt awkward. She clearly had no clue why this wine snob would raise a fuss over a bottle. I could practically hear her shouting, "It's the same wine, idiot!" Of course, it's not the same wine, and I'm surprised to see that Spectator notes about the 2002 Col D'Orcia (after scoring it 77 points), "Not imported into the U.S." This was not like comparing apples to apples. It was like comparing apples to garden rakes. My wife and friends were just as startled by the waitress' reaction as I was. For the remainder of the meal she continued to be terse and awkward, and it made the evening rather uncomfortable. We noticed on the wine list a disclaimer that seemed designed to get them off the hook in times like these: "Due to our extensive wine list, vintages are subject to change." Again, I don't mean to be rude, but let me go ahead and translate that: "Our wine list is long enough that we feel it's an excuse to be lazy and not update the vintages when they change. So don't blame us." The disclaimer should have been a warning that this restaurant is not serious about wine. Then we noticed that NONE of the white wines by the bottle were listed with vintage. We took this as a statement by the restaurant that white wines are some kind of inferior species -- which they are very obviously not. An excellent new restaurant in Geneva, New York called Halsey's boasts a diverse and interesting wine list that is marred by the fact that their Finger Lakes bottle list does not display vintages. What does that tell the customer about their opinion of local wine? The bottom line is this: Service matters, and so does vintage. Yes, there are sterilized, mass-produced wines that taste roughly the same every year. But most wines will show at least some, and often significant, variation. Weather is the obvious factor, but there's cropping, winemaking techniques, grape sourcing... the list is long. Restaurants that don't find vintages to be important are telling their customers that they don't understand or care about wine. Poorly trained service staff only cement that point. And while I'm a self-acknowledged wine geek, I should not be made to feel like the jerk in the room when I have to point this out. I'll return to Jojo; I enjoy the food and atmosphere. But next time I'll bring my own bottle and pay the corkage fee. When I venture out to other wine regions in New York State and introduce myself as being from the Niagara region, the most common response is…”Oh pinot noir, huh…how’s Warm Lake doing?” I usually give a generic answer and then talk about the other wineries that have just opened and more importantly, the other grapes that have been planted. The reality is that Warm Lake Estate and the creation of the Niagara Escarpment AVA has intentionally branded the region for pinot noir. Given the climate, length of growing season and abundance of clay over limestone hillsides, people keep making the comparison to Burgundy again and again. My fear is that this builds an almost unachievable level of expectation for these young wineries and young vines. I do believe that we have the clearest potential to make distinctively Burgundian pinot noir in the state, and by that I mean, pinot with racy acidity, earthiness, minerality and a concentrated elegance. But it’s just going to take more wineries, with small batches and experienced winemakers to begin to show how good pinot can really be up here. As of today the wineries growing pinot noir are Warm Lake Estate, Freedom Run Winery, Spring Lake Winery, Leonard Oakes and the soon-to-open Victorianbourg Winery. There are a few other growers also joining in the fun, but if you came to the area today, only Warm Lake Estate and Freedom Run would have any pinot ready to drink. My take on previously released vintages is critical. Warm Lake seems to be making a memorable wine every other year. The 2003, from what I’ve read in Wine Spectator, is great. The 2005 is easily the most interesting pinot I’ve had from the east coast. Warm Lake’s 2007 might still be too young to assess its potential. It has great color and extraction with some noticeable earthy funk, but there’s a lot of new French oak masking the fruit. It could very well balance out with time but I’m not sure the average visitor will hold it long enough to find out. As for Freedom Run, its 2007 Estate Pinot Noir has been well received. The combination of young vines and a hot year seems to have made a once in a lifetime wine that stands up well to many California pinots, though it's definitely not Burgundian in style. Their 2008 vintage will be much more typical of a cool region pinot, revealing more of what you can expect year to year -- a lighter, racier wine that may not win over those looking for big fruit-forward pinots. These might just be the same people that are buying their 2007 vintage. While there isn’t one wine I would sneak into Paris for a blind tasting yet, I can assure you that I’ve tasted some promising pinot noir grown in the Niagara and across the river in Niagara, Ontario. There’s plenty of talk about minerals, limestone and terroir these days, and there’s no doubt that we have all of the above. We are just waiting for the growers and winemakers to figure out how to take advantage of these conditions. I’m sold on the idea that it will happen sooner than later, and let’s just say that if I was planting my vineyard today, there would be a significant number of pinot noir vines along with my cabernet franc, chenin blanc and gruner veltliner…A man can dream right? I encourage followers of the New York winery scene to check out this article by Syracuse Post-Standard writer Don Cazentre. For some time, wineries in the frozen hinterlands north of Syracuse in the Thousand Island region, the Tug Hill Plateau, and the Adirondack foothills have been making a brazen attempt to grow a significant amount of grapes using cold-hardy hybrids developed by Cornell and the University of Minnesota. This article focuses on the operations in the Thousand Islands region and specific varieties developed by the University of Minnesota. Formerly, these wineries relied heavily on grapes sources from vineyards throughout the state. Now, they are attempting to cement their own regional identity. The article contains quotes from some usual sources that exhibit the "come one, come all" mentality of winery expansion in the state. The number of wineries in New York (wow! ), and the rate of growth is mentioned as well. While I think it's great that people are following their entrepreneurial dreams, I'm also aware that the issues of saturation and identity always come into play when we are talking about expansion of the New York wine industry. Has it come to pass that we can no longer talk about the "New York" industry because it is too globular and diverse to warrant a specific description? What are your reactions to this article and some of its implications? I'm still digging out at work after a week in hot, often-sunny Orlando last week, but the New York wine world certainly doesn't stop for lil ole me! You might remember that I announced TasteNY back at the end of May. In a nutshell, is that I hand-pick a set of New York-made wines, beers or spirits and get them into the hands of a small group (10-12) of bloggers. The first edition features a mixed case of Finger Lakes rieslings that was sent out to a dozen bloggers last month. So far, two of the host bloggers have held their tastings -- one in San Francisco, California and another in Atlanta, Georgia. and Chuck Hayward, and two of The BrixChicks. My friend Hardy Wallace, the talent behind Dirty South Wine hosted his TasteNY dinner at Dynamic Dish down it Atlanta, and was joined by Atlanta food and wine bloggers/writers/lovers Ed Thralls, Jim Sobeck, Bill Addison and Broderick Smylie. Red Newt Wine Cellars 2006 Reserve Riesling. Unfortunately, Hardy's bottle of the Ravines Wine Cellars 2006 Dry Riesling was corked. You can also read a report from the tasting on Ed's blog. These are just the first couple of tastings, but it looks like the wines are being very well received and impressing people. After tasting the 12 Finger Lakes rieslings, Hardy proclaimed on Twitter, "The best showing of domestic Riesling I've had." For those of us tasting and drinking Finger Lakes riesling for a while now, that's no surprise. I recently paid a visit to Heart & Hands Wine Company, a new winery on the northeastern shore of Cayuga Lake, to scoop a story for Life in the Finger Lakes magazine about the choice of winemaker Tom Higgins to specialize his operation. Heart and Hands makes several different kinds of wine from only two grapes: Riesling and Pinot Noir. In fact, 90% of the operation is dedicated to Pinot, with just 10% focusing on Riesling. Higgins’s choice to specialize so intently is unique to the Finger Lakes and might be a bit of a shock to some consumers, although most wine enthusiasts will sense the Old World emulation that Higgins is attempting to display. Even many California regions like Napa have numerous wineries that specialize in only a few grapes that are fed into a limited range of products. Higgins' educational stints in Bordeaux and California speak to his craftsmanship and expression. By far the most unique operation Higgins encountered that informed his stance on specialization is Calera, a Central Coast California winery located near Mt. Harlan that primarily makes Pinot Noir. The founder of Calera, Josh Jensen, picked his vineyard sites based on an occurrence of limestone, which is a rarity in California. Jensen views limestone as a basis for good Pinot, much like the growers in Burgundy. Higgins brought this informed perspective back to the Finger Lakes with him, searching for limestone much like Jensen did in California. Although he is still sourcing grapes from select growing sites, Higgins just cleared his own vineyard at a site he selected primarily for the vein of limestone that juts through the property. You can learn more about the six carefully selected acres in my colleague Evan Dawson's video interview with Higgins in a separate post. Limestone aside, I was even more impressed with the unique flair that he and his wife Susan -- who runs the business side of the operation -- have added to the tasting experience. For $10 visitors can take the cellar tour, but it's more than a tour. Guests enter the special-built cellar and taste Pinot Noir directly from the barrels. Higgins explains the site sources for each barrel and also compares difference batches that either had minimal stem contact or quite a bit. The result is bit of a blending game where tasters can mix, in their own glass, Pinot from different sites and varying tannic structure. There is no doubt that this exercise teaches the palate and informs the palate holder about the winemaking process. The standard tasting room experience is also a highlight. On any given weekend Tom and Susan pour the wines, educating customers about the contents of their glasses, and they offer food pairings to demonstrate the flavors in the wines. I was surprised to learn that Higgins also adds a virtual library of information on the back label of each wine he produces. A bottle of Riesling, for instance, will have vintage notes, percentage composition of the wine by growing site, and all the other vital statistics include harvest and bottling dates, residual sugar—the works. I have simply never seen this level of detail on a label before, and I must say it adds a wonderful dimension of integrity that I wish that the wider industry would consider. For an even better cool factor, Heart & Hands employs glass Vino-Seal stoppers on some of their Pinot Noir bottles. I’d heard of glass enclosures but I had never encountered one. I am almost positive no one else in the Finger Lakes is experimenting with these “cutting edge” stoppers. Likes his informative labels, Higgins is embracing a very forward-looking feel to his operation. The Riesling, Late Harvest Riesling, two versions of Pinot Noir (normal and reserve) and the Brut Rose that Heart & Hands carry are all good wines worthy of consideration. The Brut Rose especially impressed with strong honey and strawberry notes with a bit of cherry and nice acidity. Beyond the quality of the wines, the hospitality and informative tasting environment at Heart & Hands makes this winery a must-visit for enthusiasts looking for something a little bit different. "With water comes life. All kinds of life." The photo and the quote come courtesy of Amy Cheatle, tasting room manager at Damiani Wine Cellars on Seneca Lake. Like so many other vineyards, Damiani is battling mildew and trying to tamp down the water-inspired swell of disease pressure. "We need the sun," she says. Across the lake at Hermann J. Wiemer, Fred Merwarth goes further: "We need it to be dry and hot, and we need those conditions soon. We're looking at a serious challenge for this year already, and it's time for the weather to cooperate." If the Finger Lakes has struggled with rain, Long Island has had it even worse. Next week, Lenn will lay out the effects of the weather on Long Island and how growers are adapting, and I'll report on what it means for the Finger Lakes (believe it or not, there could be a very unexpected and positive outcome up here). Our reports will focus on growing practices -- but they'll also be helpful for consumers who want more information on how their wines are made and what they can expect this year. In the meantime, let's all catch our breath on this gloriously sunny Thursday. No rain in the forecast. Perhaps the summer deluge portends a hot, dry harvest. I'm down in Orlando with Nena, Jackson and my parents this week, so that's why my esteemed colleagues have been handling the wine-related content this week. It's been a long time since I spent any sort of time down here in the city that Walt made, but when you're here with a 2 year old, you're not exploring the food and wine hot spots. You visit the places where the kid has fun. So that's what we're doing. As you can see, not all of my dining companions have been human either. But that's not to say that at least one meal won't be worth while. You see, today marks the 4-year anniversary of the day that my poor wife decided to become my poor wife. So, my parents are watching the little man tonight so we can go out to dinner to celebrate. After a bit of research, we decided to try Norman's. Expect a post soon. I'm looking forward to some real food. It occurs to me that, as the Finger Lakes produces an increasing amount of world-class riesling, there is a cycle of riesling appreciation that we all seem to go through. I admit to having gone through each stage. I am now a stage-four junky. This is expanded a bit from its nascent Twitter form, so I ask you to take a fresh look and answer: Where stage are you in? It's true that most people who are new to the world of wine prefer sweeter wines, and that means white wines. At this stage even chardonnay can be off-putting (a prescient impulse, to be sure). Riesling offers a simple how-do-you-do, an easy-drinking entry. Gewurztraminer is often too exotic. And while hybrids are approachable, someone once said that hybrids can make you sterile. The training wheels wine of choice is riesling. You have broken through to red wines and you wonder why you ever bothered with that low-class swill. You're ashamed if you can see your fingers through your glass of wine. You prefer to chew wine, not drink it. Trees were made for paper and cabernet sauvignon. You like your wine drier than a NASA-tested poncho. Why, everyone knows that riesling is for beginners, and you are hardly a beginner anymore. Let's go in on a case of Opus One! After case upon case of cabernet your palate is weary. At a party someone hands you a glass of white wine and you fake enough enthusiasm to muse, "Oh, chardonnay?" When you're told it's riesling you glance around, see who's watching, and take a sip. What's going on here? They can balance that sugar with acid? How come no one told you that? Furthermore, you're floored to hear that in places like the Finger Lakes winemakers are producing rippingly dry rieslings. You take yourself off the list for 3 Rings, you thank the wine gods that you never were approved to buy an allocation of Screaming Eagle, and you head for Mosel. And Alsace. And the Finger Lakes of New York. You only tell a select few erudite friends. Everything is clear to you now. No other wine in the world can range from bone dry to toe-curlingly sweet and still find the balance to keep a bowling ball on a tightrope a hundred feet in the air. Your Fritz Haag checks in at 7% ABV, about a third of the ABV of those untouched monsters sitting in your cellar, and you love it. You recently opened a Gunderloch that you're pretty sure is responsible for sending your friend's cancer into remission. And you stockpile vacation days just to explore the dozen-or-more Finger Lakes producers who are carving out an electric style unseen in other parts of the wine world. You dream about four-hour dinners with Lyle Fass and you've named your dog "Auslese." The Cycle of Riesling is complete. From beer to old Bordeaux, ice wine to disappointing wine, here's what we've been drinking. I'm in Orlando right now with Nena and Jackson for a week (yes, a week) visiting all of the usual kid-friendly haunts -- Magic Kingdom, Animal Kingdom, Sea World, etc. The wine selection in the nearest grocery store isn't much better than the "lists" at the restaurants we've been checking out. I know you don't want to hear about Kendall-Jackson Chardonnay or Blackstone Merlot anymore than I want to drink them, so instead I'll mention a beer that I've been drinking quite a bit at the resort pool -- Shock Top Belgian White. I know what you're thinking "Lenn, that's an Anheiser-Busch beer. It's as Belgian as Budweiser is German." That's true. I can't argue with that. But, when you're options on a 95-degree, 99% humidity day are that, Miller Light, Coors Light, etc. it's the best of all evils. As you can see, they serve it with a wedge of orange and I noticed last night that they actually squeeze said orange wedge into the beer. It barely tastes like beer actually, but on a hot, muggy day -- especially poolside -- I've been enjoying it. So shoot me. Wine lovers are famously generous with their prized bottles, but if you want to drink something historic, it helps to be lucky. Our friends who came into possession of this bottle were lucky and we were lucky enough to be in their company when they decided it was time to try it. This was a half bottle so we were skeptical about its chances. On top of that, the owner of this bottle had no idea how it had been stored for more than 40 years. Anything was possible, but a fine vinegar was most likely. When the owner dropped his nose into his glass he let out an immediate and unrestrained, "Ohhhh!" Not only was this 1961 Bordeaux still alive, it was throttling along. I won't pretend to know how much life it still might have had, but suffice to say: plenty. And when we finally reached the last sips in our glasses it was a mark of how special this wine was to glance around the room and realize that no one wanted to finish it off. I could have smelled that wine all night. When we left that evening I briefly searched my mind for how I could repay the generosity, but it hit me: Not only would I fail to match the Figeac, but friends don't open special bottles only on condition of reciprocity. I can only hope this friendship ages as beautifully as that mysterious half-bottle that brought such excitement. During a holiday weekend filled with beer, mojitos, margaritas and champagne toasts, I managed to open a bottle or two of Niagara region wine for my friends in Boston. If there’s one local wine that begs for a special occasion it has to be ice wine, and no, I’m not talking about artificially frozen grapes. The wine has to be made from naturally frozen on the vine fruit and pressed outdoors while still frozen. This Schulze Vineyards & Winery 2008 Block Three Ice Wine is a one of a kind wine as far as I know. You’d never guess the grape variety, thanks to its complex flavors of green apple, citrus, pineapple and pear. While it is sweet, it also retains an explosive acidity that you don’t generally find in most ice wines. It will make you rethink everything you think you know of the Catawba grape, that’s right, I said Catawba. A blind grab in the cellar resulted in this "Where did this come from?" bottle of Malbec from Argentina. I assume it might have been brought to the house by a guest. I had high hopes, but the 2008 Gascon Malbec got off on the wrong foot with a synthetic enclosoure. It continued its mediocre impression with hints of blueberry and cocoa that did not overcome the flat, uninspired taste through the finish. I was surprised to see that past vintages of this wine have scored well. It was okay, but really didn't have us going past the first glass. Last week on Twitter, Morgen McLaughlin of Finger Lakes Wine Country said, referring to a short piece by Wine Spectator's Thomas Matthews, "This is why Long Island wineries need to submit wines for review to Wine Spectator." As you can see, the story includes Matthews scoring at\ Lenz Winery 2005 Old Vines Chardonnay 90 points. Morgen has done a great job getting Finger Lakes producers editorial coverage in the Spectator over the last year or so -- mostly by submitting a boatload of wine to the magazine (both current releases and library wines). In her words, "The formula is simple. Wine submissions = editorial coverage. End of story." We discussed, all via Twitter, the advantages of her organization coordinating mass submissions (are you listening, Long Island Wine Council? ), the differences in the two region's sizes and how great (and I agree) James Molesworth has been for the Finger Lakes. He covers the Finger Lakes for WS, by the way, with enthusiasm and fairness. The discussion had me thinking to myself "Aren't most Long Island wineries sending wines already?" Matthews implies that they aren't in the story, and I have heard several winery owners and winemakers complain about Wine Spectator's "blind" tasting procedures, the perceived 90-point ceiling for New York wines, etc. But, I hadn't asked many of them in any sort of organized way, so I decided to do that. I sent a quick, informal survey to the Long Island wine community that asked some basic questions: Do you send wines to Wine Specator? Why or why not? What advantages have you seen? Etc. As one might expect, responses were mixed, though generally affirmative. Most of the "on the record" responses painted a positive picture of the winery-WS relationship. Rich Pisacano, co-owner of Roanoke Vineyards told me that they've only sent wines "Twice in four years, but I plan to continue" because "We experienced a positive response and interest for our wines from an 88 point score for Roanoke Vineayrds 2003 Cabernet Sauvignon and more recently 89 points for our Roanoke Vineayrds 2005 Merlot." Just a few miles east of Roanoke, Alex Macari of Macari Vineyards tells a similar tale "We have always submitted to Wine Spectator ever since we opened the winery. Great benefits! We have had customers walk in with the magazine requesting a case of a particular wine just because of a review." Richard Olsen-Harbich, winemaker at Raphael who has been making wine on Long Island since the 1980s does submit his wines, but added that "I would see a bigger benefit with a couple of 95s. Believe it or not it seems as if the scores we received for our wines years ago were more generous than they are today -- somewhat incongruous with the fact that our wines today are so much better than they were 20 years ago. I've truly been perplexed by many of the recent scores of very good local wines. I think many are much better than the scores in the context of their system. But hey I'm biased." Michael Croteau, owner of Croteaux Vineyard (a rose-focused producer) doesn't sent wines to the magazine, however, telling me simply that sending wines to Wine Spectator is "Not a priority. I don't see the benefit for us." But the owner of a far larger (and we can assume profitable) winery, who would only comment off the record, told me that sending wines to Wine Specator held "no benefit" for his winery, saying "I have always thought that our wines and indeed all Long Island wines have been damned with faint praise by the 'Specter' -- and by many, many others who do not taste blind, or better, double blind." Continuing to talk about the magazine's tasting procedures, he told me "The Spectator has always tasted un-blind. They may sometimes say that they taste blind but that means they assemble 50 Long Island wines and then taste them blind, obviously knowing they are ALL LONG ISLAND WINES. They may be better-than-average tasters but the literature on human bias is very, very extensive." Part 2 of this post will focus on Wine Specator's tasting process and guidlines, with information direct from Thomas Matthews himself, as well as some brief analysis of New York wine scores over the years. Long Island doesn't "need" to submit samples to Wine Specator. Morgen is wrong there. Several wineries are doing just fine without sending wines. If Long Island really wants to make an impact via the Wine Specator, they should work together, submitting wines en masse like Finger Lakes Wine Country has been doing. Again, are you listening Long Island Wine Council? The last comment I want to make is more about the piece Mr. Matthews wrote. It strikes me as odd that he'd say "Few of the region's producers choose to submit wines for review, making it difficult to establish a comprehensive context." considering that all but four of the wineries I talked to do send wines (two said they didn't know they could just send them without them being requested) and that from the sounds of it, he hasn't visited Long Island wine country in years. One winemaker told me "I haven't seen or heard of him being out here in 6 or 7 years." I think Mr. Matthews is based in NYC, so it would seem that if he's going to cover the Long Island region, he could easily visit with some sort of regularlity. I know that Mr. Molesworth visits the Finger Lakes more often than once every 6 or 7 years. Stay tuned for more on the Wine Specator topic. Should be a fun ride.